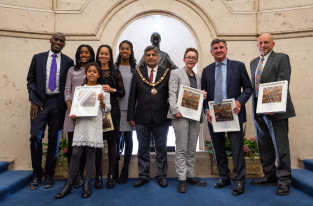 A phenomenally-talented musical family, a women’s rights campaigner, the man behind the modern Goose Fair and a much–respected education champion have been honoured in the Nottingham Awards 2018. The awards, now in their seventh year, were held at the Council House last night (Thursday) following the historic 724th Goose Fair opening and dinner. They celebrate those who have helped to make Nottingham the great city that it is, and each winner has made a lasting contribution. The awards are a way of recognising that achievement and an opportunity to say thank you. Melanie has worked in Nottingham for almost a decade and made huge contributions to the community and voluntary sectors. She is being recognised with this award, however, for her work in a former role as manager of the Nottingham Women’s Centre. During her tenure, she made sure that the centre became known locally and nationally as being a key driver on women’s issues. Her public campaigning brought about a significant policy change to recognise misogyny as a hate crime. Before his retirement from Nottingham City Council this summer, Alistair spent three decades dedicating his time to improving educational and cultural opportunities for Nottingham’s young people. Thousands of children have benefited from the opportunities that he made available. Alistair established a broad, balanced and dynamic curriculum, which went beyond the core subjects, introducing after-school and weekend tutored sessions with steel bands, youth orchestra and drama. The Mellors family has been travelling the country putting on attractions for more than a century. Their association with fairs and showmen dates back to the 19th century when they had a pig farm in Hyson Green, before running a swing boat and shooting gallery in Bulwell. However, it was James Mellors who built the iconic Nottingham institution that is known today. The Mellors are at the heart of the city’s Goose Fair celebrations every year, as well as putting on the hugely popular Winter Wonderland and summer Beach attraction in the Market Square. Thousands of people will know about the incredibly-talented cellist Sheku Kanneh-Mason who is a BBC Young Musician of the Year, has a number one-selling classical album and performed at a Royal wedding. As amazing as Sheku is, however, he is a member of an equally impressive, wider musical family. There are seven other members who are fantastic performers in their own right – together they have promoted Nottingham around the world. But despite this enormous collective talent, they exhibit humility and modesty, and go about their lives like any regular family. Over the past few years, a number of notable local people have received the Nottingham Award, including Jim Taylor, the man behind the city’s tram; Derek Brewer, former cricketer and chief executive of Nottinghamshire County Cricket Club; and Sat Bains, the Michelin-starred chef and restaurant owner. 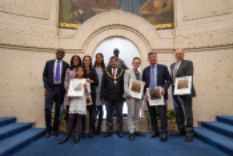 Councillor Neghat Khan, Portfolio Holder for One Nottingham, said: “Every winner of this award has been chosen because they have made a significant and lasting contribution to Nottingham locally, nationally and internationally. “We are a city with great success sitting alongside real need. Nottingham is a place where people strive to succeed in their chosen field and support others who may not have enjoyed the same opportunities in life. We also celebrate those who have overcome circumstances beyond their control. Guests at last night’s event were entertained by musician Rob Green, recently back from supporting Earth, Wind and Fire on their UK tour. Meanwhile, money was raised for The Dolly Parton Imagination Library and the Women’s History Group.